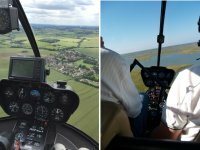 The 60 minute Trial Lesson experience is a great way to get an idea of what it's like to take control of a helicopter in flight. The experience starts with a 30 minute classroom briefing on the effects of the controls of the helicopter. Once you have been fully briefed you will be shown to the helicopter to begin your flight! The 30 minute flight typically starts with upper air exercises, before focusing on low level exercises such as the hover. This gives the Instructor time to allow the student to try out a few exercises, as well as allowing time for some advanced demonstrations. Students are given each control individually before combining multiple controls. Our aircraft all have dual controls. * We have a 72 hour cancellation policy. * You must be 14 years old or over. * Maximum passenger weight is 16 stone. * All flights are weather dependent.